I bet you are wondering why I have not posted pictures in a few days. Well, I have been busy like most of you I am sure. Give me a day or two and they will appear. Now on to Christmas Dinner. 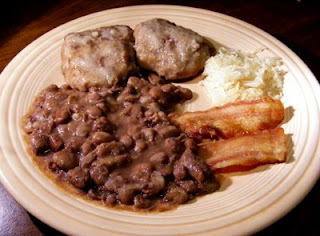 I bet many of you have never heard of bean balls, correct??? Well around Beaty's Creek they were common when I was growing up. Now a few people still make them and I am one of them. My husband's dear grandmother, Minnie, taught me how and I am now teaching Raven. It is a family tradition, have to pass those down. I will give you the recipes and post the pictures in a few days. Add beans to pot. Add water, salt and oil. I add oil so my beans will not boil over. It really works. Bring beans to a hard boil and reduce heat. Cook over medium heat all day. The beans will be done before that but we like our beans to have a creamy broth and cooking all day insures that. You will have to add a lot of water through out the day. DO THIS OR BEANS WILL SCORCH!!! I make my own but if you are using store bought make sure it is not a Bavarian Sauerkraut. You want the ingredients to read cabbage, water, salt and vinegar ONLY! I coat my skillet with oil and add drained sauerkraut to the skillet. Cook over medium heat until heated. Let me tell you this, you can always add bean water or boiling water but you CANNOT ADD CORNMEAL. REPEAT DO NOT ADD CORNMEAL. Now back to the recipe. I pour about 7 cups of cornmeal into a large bowl. I then add 1 or 2 cups of beans. Don't stir yet. Now is the time to add boiling bean water, yes the water you cooked your beans in. Add it a cup at a time and stir between cups of boiling bean water. You know you have added enough when you can make a ball and then flatten it out and the ball stays together. Make sense??? I hope so. Believe me it took me several attempts to get this right. Once the "balls" are made you will add them back to the bean water. I remove most of the beans and place into another pan with bean water. You want to have the bean water a slow boil. Cook for about 15 minutes. The cornmeal will already be cooked from adding the boiling water. You are just cooking the outside and firming them up a bit. Remove the "balls" from the bean water and plate up. We eat ours with oil over then with lots of salt and pepper. Yummy! Place into water and boil for until foam forms in water. This usually happens in about 10 minutes. Drain very well. Place on deep cookie sheets and place into a 400' oven until golden and crisp. I NEVER COOK SALT MEAT ON TOP OF THE STOVE!! It pops 100 times worse than bacon. In the oven is my trick and it works soo well. You just have to use your self clean on your oven the next day but it is worth it!! I hope you will try all of this sometime! It is soo good and it is "what's cookin" tonight!